The Founding Fathers built the groundwork for America, but they were much more than military strategists and document writers. Like modern Americans, the Founding Fathers knew how to enjoy life, and spent their leisure time (and in some cases, work time) grabbing a pint at the tavern, scarfing down desserts, and exploring the great outdoors. To celebrate these iconic Americans, we’ve compiled 12 favorite haunts of the Founding Fathers that you can still visit today. 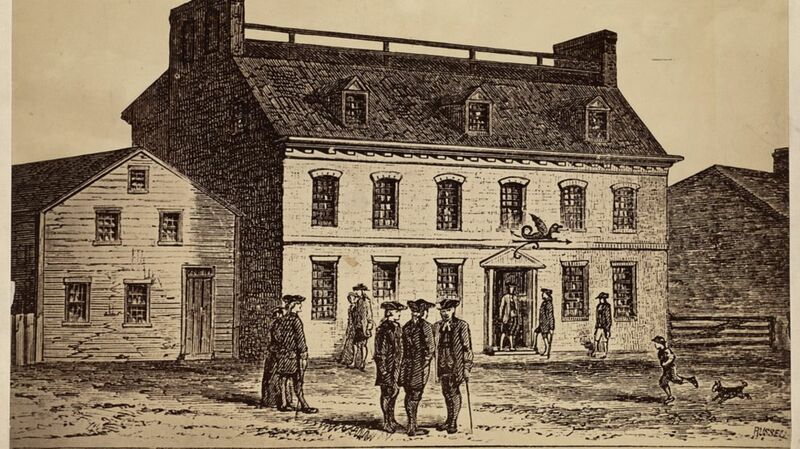 The Green Dragon Tavern was known for its drinks, but it was also an important meeting spot where the Founding Fathers made important decisions about this country—like to throw the Boston Tea Party (and the equally important decision to save their rum and toss the tea! ), and the resolutions that built our Federal Constitution. It's also often claimed that this is where, in 1775, British plans for the invasion of Lexington and Concord were overheard and Paul Revere was dispatched for his famous ride to warn the colonists. (According to a letter from Revere, they only met at The Green Dragon until November 1774, when they discovered that they had a traitor in their midst and moved to a more secure location.) The Green Dragon is no longer in its original location, but its historic significance as the “Headquarters of the Revolution” remains strong—just like its rum punch. Back in the day, big names like Daniel Webster and Paul Revere frequented Bell in Hand for its good booze and great company. Opened by the retired town crier in 1795, it was known as the primary alehouse in Boston (its proprietor refused to sell harder liquors). Today, Bell in Hand (which moved to its present-day location in 1844) is more about dancing and drinking than defending our country’s freedom. But hey, even the Founding Fathers had to let loose sometimes, right? John Adams's former residence—his “sweet little farm”—has been turned into a historic museum center that tells the story of the Adams family, from its presidents and first ladies to its writers, and everyone in between. And though you can't grab a drink at the site, if you'd like to drink like the second president, start your morning with a tankard of hard cider. Adams was known to down hard cider for breakfast every day, starting from when he was a 15-year-old student at Harvard through his presidency and retirement. George Washington may have traveled all over this country, but his favorite place of all was home sweet Mount Vernon. Today, you can dine like George Washington just steps from his estate at the Mount Vernon Inn Restaurant, which serves some of the legendary president’s favorite dishes like freshly caught fish and apple pie (though they don't have his beloved Madeira wine). The Mount Vernon Inn does not require admission tickets like the GW Estate and is a great way to taste some Founding Father flavors. Before leading the army to Cambridge in 1775, George Washington spent the night at New Haven's Beers Tavern, and gathered 100 Yale students (including the fife-playing Noah Webster—he of dictionary-creation fame) in front of the bar the next morning to march with him out of the town. Fast forward more than 240 years, and you can still dine and imbibe at this iconic spot—now called Bar Ordinary—which has also seen visitors like presidents Abraham Lincoln and William Howard Taft. While visiting the New England area in the late 1700s, George Washington made a pit stop for cod fishing in the Piscataqua River right off the shores of Kittery, Maine. Washington didn’t have much luck on his trip—he reported only catching two—but today, you can give it a try to see how your fishing skills compare to our nation’s first president. Rumor has it George Washington celebrated Rhode Island’s ratification of the U.S. Constitution in 1790 at—among many popular places—the White Horse Tavern in Newport. Today, you can raise a glass at the White Horse just like Washington, but don't dress like you're headed to a pub—this iconic spot requires country club or business casual attire. James Madison and Thomas Jefferson crossed Lake Champlain from New York to explore Vermont—which had just become the 14th state—in early 1791, but the two Virginians left mostly unimpressed by the area as a whole, saying that it is "much larger but less pleasant water than L. George." But Jefferson did appear to be enjoy the fish, mentioning the 20-pound catfish, sturgeon, and salmon, and he was also pleased by how few mosquitos were in the area. On July 11, 1804, vice president Aaron Burr shot and mortally wounded Alexander Hamilton in America’s most famous duel. While you may not (read: should not) reenact the Burr/Hamilton duel scene, you can walk the grounds where this historic event took place at the Hamilton Park in Weehawken, New Jersey while reciting Hamilton lyrics if your head. Side note: Don’t forget your camera, because Hamilton Park also has some of the best NYC skyline views! We can thank Philadelphia’s historic City Tavern for supplying the food and spirits needed to make this country what it is today. The Founding Fathers spent many late nights here while preparing the Declaration of Independence and The Constitution—according to George Washington, on September 17, 1787, after the Constitution was signed and ready to be sent to the states for ratification, "The members adjourned to the City Tavern, dined together, and took a cordial leave of each other." While today’s clientele may have fewer powdered wigs and breeches, you can still dine and drink circa the 18th century at this fully operational, completely reconstructed tavern. With guests like John Adams, Alexander Hamilton, and Virginia native George Washington, the Gadsby's Tavern made quite a name for itself among the country’s most elite. Thomas Jefferson was even honored with a banquet there in 1801, the year he became president. And though you may not have an inaugural fete thrown in your honor, you can dine on "George Washington's Favorite" (a grilled duck breast with scalloped potatoes and a port wine orange glaze) or "Gentleman's Pye" (a lamb and beef red wine stew in a pastry crust) in this National Historical Landmark’s Colonial-style dining rooms. Lower Manhattan’s Fraunces Tavern is possibly the most monumental haunt of them all—it served as the location of General George Washington's farewell dinner to the officers of his Continental Army after the last British soldiers left America in 1783. Today, you can visit the Fraunces Tavern Museum’s Long Room—the site of Washington’s speech—and grab a pint to (figuratively) pour one out for the most famous of the founding fathers, and all the early Americans who helped make the revolution a success.